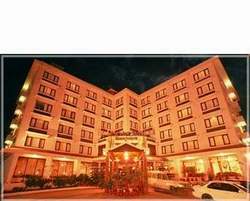 Hotel Vaishali Kathmandu one of the grandeur colossal hotels of Kathmandu, snuggled in the Himalayan kingdom of Nepal. Vaishali an emblem of purity & elegance, where one can get all sort of modern luxurious as well as Nepali tradition & culture. Situated at the most center part of the city the main tourist attraction center, Thamel 9 kms. Away from the International Airport, Kathmandu. Hotel Vaishali Kathmandu offers guests a choice of 95 centrally Air conditioned elegant rooms with 8 splendid suites, all rooms are elemented with color TV with remote control , individually controlled Air Conditioning, international direct dial, attached shower baths.